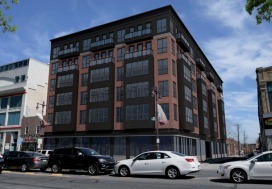 The Philadelphia City Planning Commission gave support to a new building to be built on North American Street, a wide street in South Kensington that has traditionally been an industrial street. This new building will be an apartment building, with office space for high-tech and creative businesses on the first floor and a retail space for a restaurant/café. It is being called “Techadelphia”, since it is intended to attract those high-tech businesses. 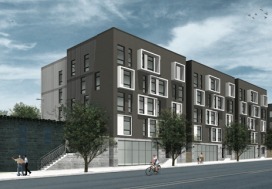 This kind of development is intended to move the lower part of North American Street to a new course of development creating a new neighborhood with more modern jobs. Techadelphia is being dev eloped by Frankel Management Company and Streamline Solutions and is being designed by Harman Deutsch Architects. The new building will be five stories tall and will have 64 apartments. There will be eighteen townhouses built behind the building on Phillips Street, across the street from a block of similar sized townhouses. The first floor will be all loft office space, except for the restaurant/café on the southern corner of American Street. Parking for the apartment and office building will be in the back of the building, accessible by a drive aisle that will also lead to the garages of the Phillips Street townhouses. The façade will have modern brick and glass panels, with large windows. The size of Techadelphia is allowed under the current zoning. 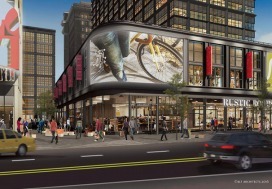 The developers went before the Planning Commission’s Civic Design Review board, already, whose only suggestion for improvement was to widen the sidewalk along Phillips Street. The developers would like to begin construction soon, but first they must get zoning variances to allow residential and restaurant uses, since that stretch of North American Street is zoned only for traditional industrial uses. The Planning Commission is considering rezoning that part of the street to allow these new uses. 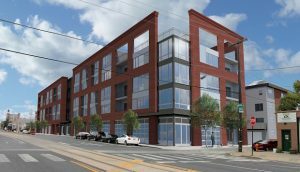 Another developer would like to build another, larger residential development further south on American Street with live/work spaces for artists and office and retail space on the first floor, called Soko Lofts, soon. And still another developer has proposed an apartment complex, just to the south of Soko Lofts, which would have apartments and retail space right on American Street. Techadelphia is another development which would change this stretch of North American Street into the new, more high-tech neighborhood, that the developers envision.